Cooper Creek, a long, intermittent stream in outback Australia, has provided photographer Pete Dobré with some spectacular scenes of God’s creation. Over 3 and a half years, Pete and his family—wife Cil and children Tess, 6, and Jed, 3—made the long expedition to Cooper Creek nine times to photograph its wildlife, its dawns and sunsets, and its magnificent variety of landscapes. This unpredictability makes for some amazingly diverse scenery. Pete recalls his fascination at seeing in this desert creek a tree which he called ‘the burning bush’. He first photographed this tree at dawn with the sun behind him. ‘The dead tree seemed to come alive with its vibrant colours’, he said. ‘I named this shot "the burning bush" after the bush mentioned in the Bible which burned but was not consumed when God spoke to Moses’ (Exodus 3:2). 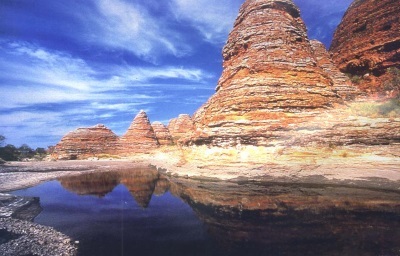 This picture was chosen as the cover for Pete’s recently published photo-book, The Cooper Creek in Outback Australia. 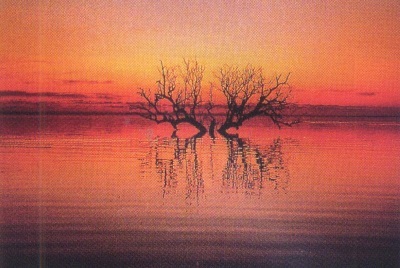 Six months later he photographed the tree again—the former desert creek was now in flood, with ‘the burning bush’ engulfed in water that had flowed down from Queensland to Lake Eyre. An impressive series of four widely contrasting photos of this tree, at different times of the year and over a three-year period, form a much talked about set of pictures in Pete’s book. Pete is also a schoolteacher who specializes in media studies. His expertise as a photographer has allowed him to set up dark rooms and provide photographic advice for schools as well. He gives God the glory for providing the subjects for his photographs, and when he is invited to show his high-quality slides, he always starts his presentations by quoting Genesis 1:1—‘In the beginning God created ...’. These words also appear on the back of all his landscape Oz Scape greeting cards. He has never had a negative reaction to this at slide presentations, and has had only one refusal from a store which he approached to sell his cards. ‘The lady said she was an atheist, so this gave me a good opportunity to talk to her about creation’, he said. When did Pete’s interest in photography begin? Pete, now 37, came from a broken family. He said he has made sure his children do not have to go through what he did as a child. He was born in Barmera, a small grazing and fruit-growing town in the Murray River valley in South Australia. At the age of 15 his involvement with a local church basketball team led him to receive Christ as his Saviour. His interest in creation science began in 1978. He attended a lecture by a visiting American speaker, and the interest from this was reinforced when he heard other creationists speak. He complained to the editor about it, but has yet to see a satisfactory outcome. Pete’s favourite photo is of a desert rainbow. He said he is always thrilled when he sees a rainbow, because it reminds him of God’s promise in Genesis that He will never again send a worldwide flood as He did in Noah’s time. While shooting photos for his book, Pete arose at dawn one morning and began walking along the shore-line of Cooper Creek. Giant clouds rapidly swept across, and light rain began to fall. Suddenly a rainbow appeared. Things don’t always work out so well. He once travelled to Central Australia to photograph Ayers Rock in the rain, only to find the rain had dried up just before he got there. Another time, he thought he had taken some breathtaking photos of brolgas and red-tailed black cockatoos in the Kimberley region of Western Australia. He was then shocked to find that the film had not wound on to the sprockets in the camera, so none of the photos was actually taken. For all this, though, Pete Dobré has a dazzling array of photographic images. And each has its own story. Even an ordinary-looking photo of flies on a twig has an interesting story behind it. 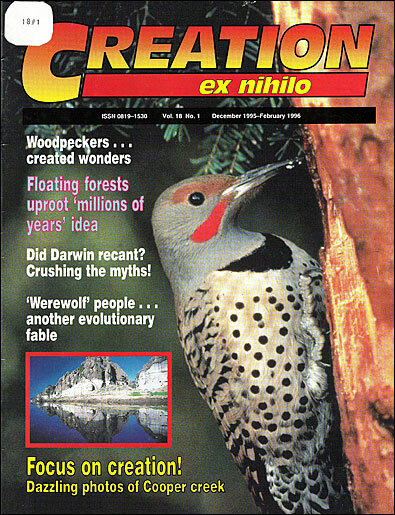 And encouraging people to think about creation is something that photographer Pete Dobré, like Creation magazine, will continue to focus on.